MIAMI, FLORIDA, July 31, 2015 – – Voice Talent Peter K. O’Connell was selected as the radio voice of a media promotion between Major League Baseball’s Miami Marlins and the third largest pizza company in the world, Papa John’s. Tying in a special on-line pizza combo package just for Miami Marlins fans, the radio campaign also allowed fans to choose from other specially priced pizza promos as well. Headquartered in Louisville, Kentucky, Papa John’s International, Inc. (NASDAQ: PZZA) is the world’s third-largest pizza delivery company. For 14 of the past 16 years, consumers have rated Papa John’s No. 1 in customer satisfaction among all national pizza chains in the American Customer Satisfaction Index (ACSI). Papa John’s is the Official Pizza Sponsor of the National Football League and Super Bowl 50. Papa John’s operates and franchises more than 4,600 locations in 34 countries around the world. America’s Friendly, Neighborhood Voice-Over Talent, Peter K. O’Connell, has worked with a wide variety of companies from around the world in addition to this most recent project for Papa John’s. Some of Peter’s clients include General Electric, Kraft Foods, PBS Television Network, Shell Oil, Pitney Bowes, Western Union, Bacardi Rum, Highlights HIGH FIVE Magazine, Deloitte Canada, Rich Products, U.S. Army, Starz Cable Television Network, BlueCross BlueShield, SunSetter Awnings, Time Warner Cable, Harlequin Enterprises and Darien Lake Theme Park. So another Buffalonian has left our city to find his fortune in Hollywood, CA. My friend and fellow voice talent Dan Lenard has moved his family out to California which is a loss for our area but also a loss for The American Legion Band of the Tonawandas, Post 264, where Dan has served as Master of Ceremonies for a while now. The band is very successful. They’ve won state, national and international band championships. Heck, they’ve even played Carnegie Hall in New York City. But now with Dan going off to pan for gold in Cali, the band needed a new MC. So the band asked if I would do the live announcing for their shows (Dan told them about me). Last night was my first show and everyone said it went well. All I remember was that it was hot. Like 90+ degrees hot and the sun was blasting the stage. At least I got to go backstage between my on-stage parts, the poor band members were out there the whole time but they didn’t miss a note. It was nice to do some live announcing again and it’s nice doing it with a talented group of people. This weekend it was announced that another Buffalo broadcasting legend had died. Van Miller had worked at WBEN/WIVB-TV for over 4 decades. A local boy from Dunkirk, NY, he was a sportscaster’s sportscaster. Yet, it’s unfair to limit his talents solely to sports for, like many of his peers in the 50’s and 60’s, Van did everything including hosting a game show for area high-schoolers called “It’s Academic”. It was through sports, though, that Van truly gained his fame. He had done everything in sports broadcasting from bowling shows and college play by play to becoming forever known as the “Voice of the Bills”. I highlight that quote because some years ago, for no specific reason, I was at a local cemetery and talking with one of the managers there. 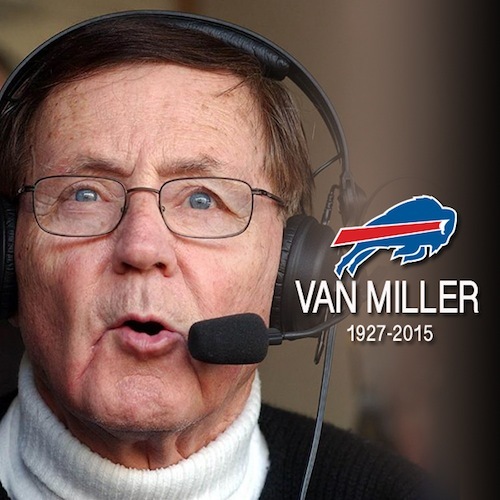 He told me that when Van Miller died, Van had arranged that his tombstone would read: “Voice of The Bills”. Save for a few years where the Bills changed radio stations (at a time where radio station competition forbade using an announcer from a rival station), Van Miller was the radio voice of the Buffalo Bills. Beginning in 1960 when the Bills became a team, through two AFL Championships and 4 failed Super Bowl attempts, Van was the team’s uncontested radio voice until he retired from the Bills radio booth in 2003 (the longest tenured team radio voice in NFL history). All this is offered with no disrespect to our very fine current radio voice, John Murphy, who seamlessly worked along side Van as a color analyst during Bills games for many years. As you can imagine with such a storied career, there were accolades and honors for Van Miller by the score, most of which are likely better reported elsewhere. To note just one significant testimonial, none other than the late Steve Sabol of NFL Films recognized Van as one of the best football play-by-play analysts in the history of the game. Here’s quick look (and listen) at Van’s remarkable career. Van’s passing got me thinking about my one public interaction with him and what a great wit Van was. Van was always part MC, part comedian and part broadcaster – a perfect and winning combination. I’d like to tell you our podium work together on this one night was recorded someplace other than my brain but it wasn’t. It was the early 90’s, the Internet wasn’t quite the Internet yet and cell phone only made phone calls. Some of you of a younger age are now staring blankly at the screen right now in astonishment but I’ll press on anyway. I was working as Assistant General Manager of the Buffalo Blizzard of the National Professional Soccer League (NPSL). Our indoor soccer team was very involved in the community and especially youth soccer. So we would often participate in events and I was “the face” of a few of them. My recollection of this particular event was what I believe was called the “News 4 Scholar Athlete” program, presented by Channel 4 (where Van was Sports Director) and sponsored in part by the Buffalo Blizzard (hence my involvement). Part of my job that night was to join Van at the podium during a dinner at a local restaurant to honor some of the nominated athletes and present the award to the overall winner (I think that’s right but this is a story, not a deposition). What you’d want me to tell you here would be the specifics of what I recall was mutually witty repartee between Van and myself at the podium. I’d love to. As usual, however, when improvising I rarely recall what I said (cause at such a time my brain is intensely focused on immediately listening and coming up with the next line, not so much on retention). Nor do I remember what Van said. What I do remember was the laughs we got. And by we, if you were scoring at home, it was 60/40 in favor of Van. I’d have been happy if it was 90/10 (Van) just to have had the experience of very briefly working with him. It was a joyous moment for me working with a fellow broadcaster, albeit a vastly more experienced one who had long ago perfected his comedic timing but was also willing to share the rhythm and fun of the presentation with someone else who could (kinda) keep up. It wasn’t planned but it flowed and for me it felt great. As you can imagine (as least I can) I doubt it left Van with as memorable an impression and I’m OK with that. Anyone who saw Van perform outside of a studio or a broadcast booth at one of these kinds of functions (especially when he was honored into so many Halls of Fame) enjoyed watching a great performer from an era where you needed to be a performer to make it in radio and TV broadcasting. That versatility is sorely missing from many of today’s up and coming broadcast performers (especially on TV) where a tele-prompter is more of a crutch than a tool. Van’s been out of the spotlight for many years but this city, his city, has never forgotten him. And with their remembrance comes a smile. And deep appreciation. Two Peters walk into a bar…would be the start of the joke if in fact it weren’t a true story. Here’s the story: I was flying into Minneapolis-St. Paul International Airport (MSP). 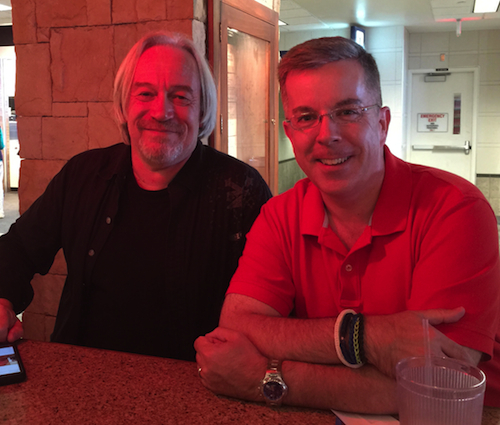 As I was taxing to the gate, I see a Facebook post from my friend and fellow voice-over talent Peter Bishop which made reference to the fact that he was at MSP to catch a plane home. Other friends of mine have posted that they are at an airport I’m landing at and I come to find they’ve already taken off or they are in a terminal two miles away and we won’t be able to connect. Not this time! Peter’s connecting flight was long delayed, so we got to have a nice visit. 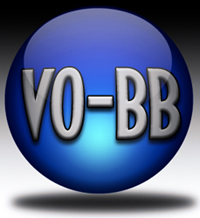 Not only is his voice-over business thriving but he also serves as a very active director on WoVo. 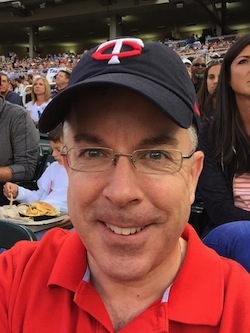 Unfortunately, Mr. Bishop could not blow off his flight and join me at the Twins game (Twins beat the Orioles) but it was great to see him nonetheless.